People new to this line of thinking might wonder what he means by demographics as destiny. 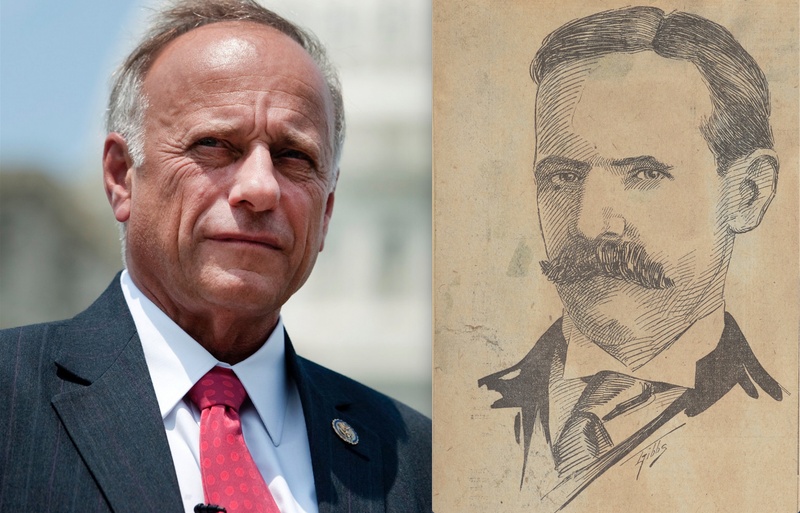 By way of explanation, I’m reminded of a curious moment in Virginia history. I have a book coming out this year about the history of the University of Virginia, and while researching it I read about Caroline Preston Davis. The granddaughter of John A. G. Davis, a professor murdered on the Lawn in 1840, she petitioned UVA for admission in 1892. The university had refused women in the past, but Davis came from an important family. Besides her grandfather, the alumni in her family included her father (the Reverend Richard Terrell Davis, known during the Civil War as the “Fighting Parson”) and three uncles. The Board of Visitors no doubt felt a certain pressure to accommodate her request and so she was allowed to take classes—but only under the most narrow of conditions. Women could take classes if they were white, of “good character,” had shown “adequate preparation,” and paid the same fees as men. But they were only allowed to study privately with professors, and upon completion would be eligible for a certificate and not a diploma. Davis jumped through those hoops and passed her mathematics test with distinction. Then, in 1894, the university changed its mind. The faculty decided that women shouldn’t be admitted after all, citing among other concerns that an education might “physically unsex” them. * If white women attend university, they will be unsexed, which is to say, they will no longer be able have babies. * Black women, who are not able to attend university, will not be unsexed. They will be able to have babies. 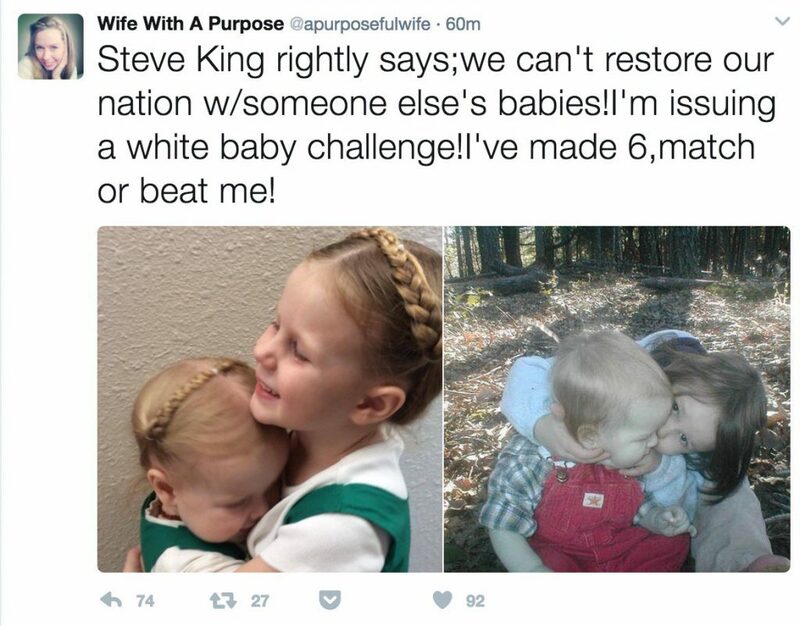 * If black women have babies and white women do not, then the black population will rise and the white population will fall. 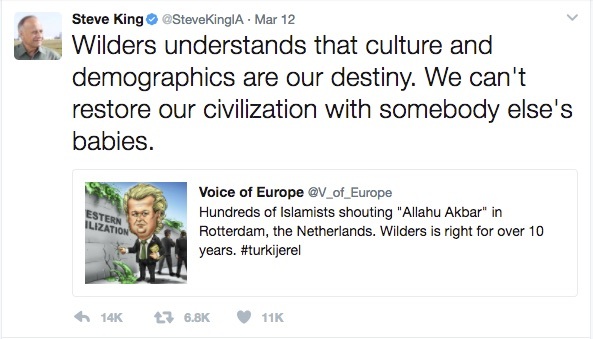 In other words, Steve King’s “demographics are our destiny” is not only not new; it was pretty much baked into the thinking of elite Virginians and the University of Virginia not so very long ago. So much so that it could be referenced in passing, as if everyone already understood what it meant—even in the the seemingly unrelated context of women’s education. ← The Podcast Is Here! On facebook a man been on a Island for twenty years, all wite people dislike people of color. just a place you all need to live. Not bein funny, but you all can build your wite race and don’t need to worry about mix colored.